Nothing could really live up to 2012. That year was so full of extraordinary experiences and memories for us that 2013 didn’t have a chance. But it tried…. In February, we spent Superbowl weekend in Taos for some R&R and winter play with the kids. We also took a mini-getaway to Canon Del Rio in Jemez Springs for Valentines weekend without the kids. In March, Charlie & I celebrated our 5 year wedding anniversary. I planned the day of romance for my love. We started with breakfast, then a horseback riding romance package, lunch, massages for two, a movie, and dinner/drinks. Charlie said he felt like a contestant on “The Bachelor”. LOL! Mission accomplished, it was a milestone anniversary. Also in March, we enrolled Gentry in Tee Ball. I secretly signed Charlie up to be one of the coaches. It was something he moaned about but eventually embraced and was really good at. He was a natural at it (boy, did it take a lot of patience looking from the outside in LOL!). Gentry had always seemed to enjoy playing baseball in our backyard but doing it in an organized real team setting posed to be a challenge and he struggled with performance anxiety & shyness for a few weeks. He eventually got over it, and proved to be one of the most powerful batters on our team. Go Gentry!! In April, I celebrated my 35th birthday in style (for once). I did a spa theme and had some girlfriends join me for some R&R, massages, food, & people watching (Zombie watching on Central Ave LOL!) from a loft that I rented downtown for the night. Ironically, it ended up being an actors condo from Breaking Bad (Jeremiah Bitsui)!! What a neat birthday surprise! We girls had a lot of fun! Also in April I began months of training as a CASA (a Court Appointed Special Advocate) to give foster children a voice in the system. I also continued my volunteering with the Make-a-Wish Foundation of NM, the Junior League of Albuquerque, and the Childrens Grief Center of NM. These were all continued signs of what was to come later in the year…. In May, we drove up to Pueblo, Colorado to watch Charlies 18 year old son Aaron graduate from Highschool. It was a great road trip with the kids, a nice graduation seeing Aaron, and great mini-vacation of swimming at the hotel, going to the Pueblo Zoo, and visiting Charlies friends. In June, we went to Houston to visit with Charlies family. 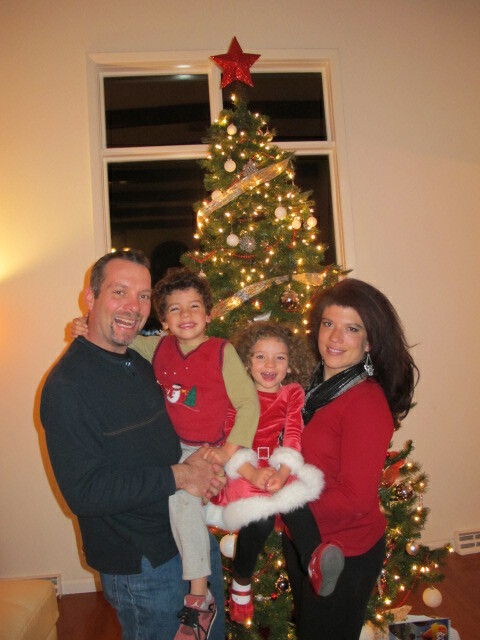 We had a blast with his brother Matt & his girlfriend Misty and her wonderful children who are so great with ours. We went to Splashway water park, and had many enjoyable nights cooking and catching up with his family. In June, my twin sister Yvonne, moved in with us for a few months after her home sold before moving to Austin, Texas in August. It was big move for her and a big change for us, living in different cities for the first time. But change is good and absence makes the heart grow fonder, right? She’s loving Austin, except for the traffic. In July, I quit my job at Ernest Health after nearly 6 years (Mid-thirties crisis or destiny?) and in August, I started at NMSU in the Social Work Masters degree program. As part of my degree requirements, I also began working as an unpaid intern at Albuquerque Public Schools shadowing a Social Worker at 3 different schools for 16 hours per week. Getting back into school was definitely an adjustment. Last minute “procrastination motivation” is very risky with two small unpredictable children in the wings. My classes are every evening Monday thru Thursday from 6 to 8:30pm. I couldn’t have done this without Charlie, he has been such a help. In July, we took a week long vacation to Breckenridge to stay with Charlies friend Daniel Tobin. The kids had a blast doing all kinds of outdoorsy stuff (fishing, boating, hot tubbing, 4-wheeling, jeeping, and hiking on the ski slopes) and I also enjoyed catching up on my trashy cable TV. We had a great time, didn’t want to leave. At the end of July, Gentry started Kindergarten at the public Elementary school in our district. He got off to a very rough start, getting into trouble with his teachers on a weekly basis. He was 4 when school started (year round school) so we think he’s maybe a little socially immature in comparison to his peers. He continues to struggle with behavior at school (not academics) so we are somewhat stressed out trying to figure out what to do for him and how to help him. In early August, we went to Amarillo, Texas for a Tomlin Family Reunion. We celebrated all things Tomlin at the Palo Duro Canyon park. We took in the Texas show there and had a blast catching up with family. Gentry even learned to swim all by himself in the hotel pool. Also in August, we celebrated Gentry & Haven’s birthdays by having a dual party in our backyard. It was a milestone birthday for Gentry, turning 5, and moving on to Kindergarten. It was one last fun celebration with his pre-K friends before they all moved on to their own school districts. In October, Charlie and his Mom went to Washington, D.C. because she had never been and he wanted to show her all the Capital sights. Well, thanks to the government shutdown, all of the monuments and museums were closed. They made the most of it though and got creative with their itinerary. They really enjoyed their mother-son trip. Also in October, we celebrated my Moms 60 birthday while she was in town from Guam for a few weeks. A few weeks turned into a few months due to the VA postponing a minor surgery several times. I enjoyed her staying with us and the kids definitely enjoyed her company, especially in the evenings when I was in class. Also, in October, my brother Aaron and his family came to visit from Phoenix. The cousins got to visit each other (and grandma), and we got to meet baby boy Strydem for the first time. Such a sweetie pie. In November, we celebrated Thanksgiving at the Ruidoso, NM cabin. It had been remodeled and rebuilt mostly by my Dad, Charlie, & many others throughout the year since January when it was almost completely ruined due to a burst water pipe. We had a great time. We hope 2014 is less chaotic and more balanced for us. Charlie and I definitely need to start up our Operation Reconnect again in 2014 because we didn’t do it in 2013 and we definitely felt really disconnected from each other throughout the year. But then again, it was a year of many changes for us, a different household routine, a new job for me, and elementary school for Gentry. Life is still good. We’re still happy & healthy and in the grand scheme of things, that’s really all that matters. Much love & blessings to you in 2014.